ADH... OMG SO SHINY! Is it like a Shiny Pokemon? ADH… OMG SO SHINY! Is it like a Shiny Pokemon? When people think of ADHD, they think of the “ADH… ooh, shiny!” trope: Which okay, that’s legit. I was once walking into my college dorm with a friend and I spotted Christmas lights. I literally stopped in my tracks and stated “Ooh! Shiny!” I may or may not have been 24 years old. Yeah. 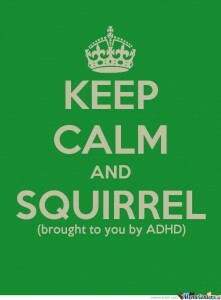 I have ADHD but it’s so much more than “Ooh, shiny!” and “OMG, a squirrel!” It’s actually a living hell. I will say that it has its perks. People with ADHD are known to be creative. I can multitask like no tomorrow and caffeine has a reverse impact on me (it calms me down and helps me focus). But that doesn’t outweigh the problems of ADHD. You know how you feel suddenly overwhelmed when you click a link on the internet, and somehow about two dozen tabs pop up? That’s what every moment of my life is like. You know what it is like when you have over two dozen tabs up, but you’re actually interested in each one? Again, welcome to my life (queue Simple Plan song here). I can’t focus. I can’t sit still. The smallest, most mundane tasks can take hours because it’s so difficult to keep focus. I lose track. I get sidelined. “Oh, I should write about this. But wait, something is happening on the Internet! Well, okay, it can wait. Oh look, a picture of a puppy. Aww. It’s cute. I like puppies. Hmm. I want to work on my service dog paperwork. Oh, I have to list a reference! I should go talk to these people!” However, the chain is not always logical and sometimes it feels like falling down the Wikipedia or the Youtube rabbit hole where you just keep clicking on random things, and that’s what your life is like. I spend my life feeling like I’m lazy. If I could just get motivated, maybe I could get the stuff down. Do that paperwork. Make this phone call. Send the email that’s been sitting in my draft folder for weeks now. Do the dishes. Swiffer the floor. You see where this is going. But dammit, I am the opposite of lazy. The thing is, my brain is just wired differently than yours. The tasks that most people do without the slightest bit of effort, takes every amount of mine. I am not lazy because it sometimes takes me longer to complete tasks. I am not lazy because things don’t get done. I am more than easily distracted. I am more than someone who is lazy. I may have ADHD. I may be unable to be medicated. But it doesn’t mean I’m lazy. It doesn’t mean I’m not intelligent. It doesn’t mean that I don’t want to do things. Oh man, I want to do them. I want to stay on topic. I want to stay on track. But with a little extra help and a heavy dose of compassion, I can achieve my goals, despite having ADHD. Not suffering from, having. Thanks for this insight. It can be so frustrating to not be able to focus and get stuff done.